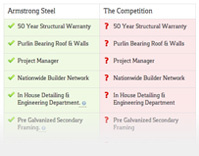 Armstrong Executives - Armstrong Steel is backed by the nation's leading team of Building experts. Armstrong Steel is backed by the nation's leading team of Building experts. Our executive team brings a unique blend of solid business experience, dedication to customer service and desire to enhance the world we live in to create the ultimate building experience. We're proud to have executives who lead by example and make us all strive for excellence in everything we do.